Laundry rooms are an important part of the house for home buyers, but this space can often get overlooked when it comes to staging. 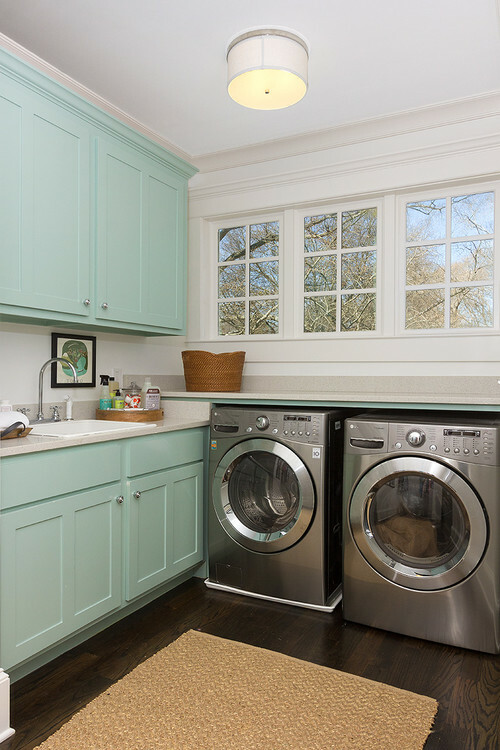 After all, how much can you really do to spruce up a washer and dryer, particularly if the laundry room is only a small room or even inside a closet? I love this! Laundry rooms are extremely underated but are an important consideration when buying a home, especially with a growing family! I walk through my laundry room as I enter from the garage to the kitchen. Last year I put in gorgeous mini copper and bronze tiles in the sink area, Had the room painted a dark chic green/touch of brown and put up two country prints – a botanical and a rooster print – both double matted and framed. It is the way I enter my home and it should be as beautifil as the rest of it. My son saw it when he came home from college and said “Mom, it looks like a ROOM!” Exactly – now I am considering perhaps a mini chandelier……Thanks Houzz for the inspiration!